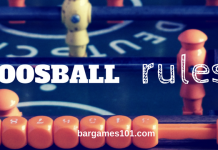 Are you unsure on how to find the best mini foosball table? Maybe it’s because you’re not sure why you need one in the first place. Mini foosball tables are mostly for kids. 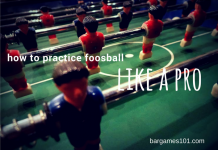 Although marketed as fun for all ages, foosball isn’t ideal for adults as a mini tabletop game. There’s a big difference in the force generated by kids operating the rods compared to adults. Most of these tables aren’t stable enough to endure intense hits and bumps. But why should you buy one of these then? 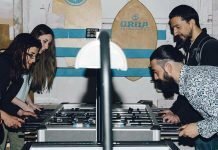 If you really want to play foosball at home, the alternative would be to buy a full-sized version of your favorite pastime activity. Yet mini foosball tables are easy to assemble and much easier to set up and store in a small home. They can be put on top of flat surface and enjoyed in any room in the house, at any time. Just make sure that you don’t treat them as you would the foosball tables at a bar or arcade. 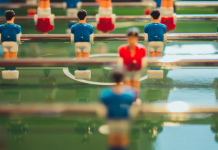 With that in mind, the best mini foosball tables are great for kids with ergonomic features, easy portability and enough sturdiness and quality to resemble a real game of foos. Let’s take a look at a few of our favorites. The Sport Squad FX40 is one of the longest mini foosball tables designed for kids and teens. It’s 40” long and 20” wide. And, because this is a tabletop model, it will also elevate 8” once placed on the playing surface. The components are high-end. The rods are chrome-plated and feature ergonomic grips made out of black rubber. Not only does this make it easier for kids to play, but it also allows more experienced players to showcase their skills. The playing surface is MDF and this mini table comes with rubber-padded legs. This is a really nice feature since you won’t have to worry about damaging your own table. There’s also a simple-to-use sliding score system. But, perhaps the most interesting feature is the 3-goalie system which makes the game a lot more beginner-friendly. As fun as foosball may be, getting a full-sized table is rarely a viable option. So what makes this tabletop model a solid choice? Maybe it’s the realism of the field and the lively players. Or maybe it’s the light weight for the size, which allows for great portability. The Mainstreet Classics Mini Foosball Table is almost 37” long and 20” wide. It sits 11” up from the playing surface. 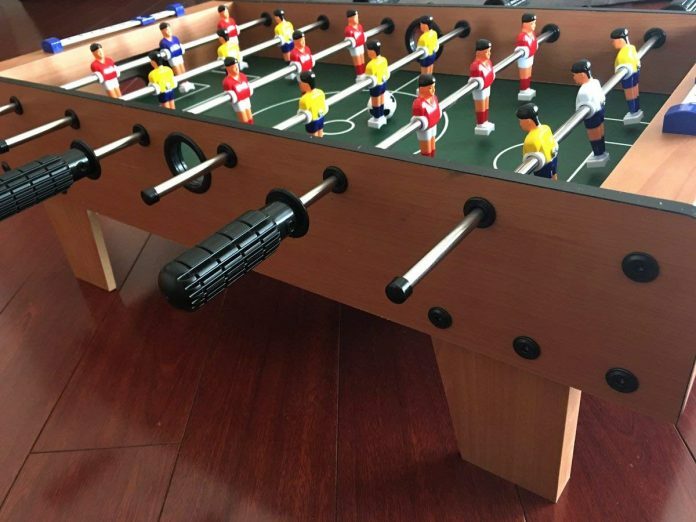 This mini foosball table is best suited for kids and teens. Don’t be fooled by the light weight though. 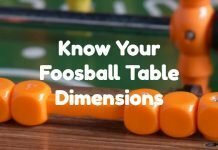 The joints are solid and this table is reinforced in all the right places, so you’ll be able to operate the rods with higher force than many mini foosball tables. If you value realistic play on a tabletop setup, you’ll appreciate the single goalie system. However, you may not like the fact that there’s no scorekeeping feature in place. This 27” Giantex is a tabletop foosball game of below average size, but it doesn’t mean it’s not as durable or stable as the competition. The four legs have rubber padding and the entire table is made of strong plywood. The steel rods have ergonomic handles but no rubber padding that can improve the grip. Still, at this price range the structure is quite sturdy and easy on the eyes too. There are three rows of three players for each team which means that you get to play with three goalies. The score keeping system is manual and goes from 0 to 9. The dimensions are 27” X 15” X 9” (LWH). The foosball field is, of course, a bit smaller than this. But not too small to take out the fun. The T&S tabletop mini foosball game is about 27” long and 20” wide. For the size, the table is a bit heavier due to the use of higher quality wood. As you would expect, the table sits on four legs but it’s not suitable for just any support surface immediately after assembly. The legs don’t have rubber padding at the bottom so you might risk scratching a wooden table with them. Of course, you can also add padding to the table. Luckily the assembly takes little to no time which is an improvement over some of its direct competitors. Each team has three rows with three players each. The rods have standard plastic handles that aren’t too amazing even though they come with clear grooves for improved control. The size of a mini foosball table isn’t too important, as long as it’s a tabletop model. However, you may want to consider the weight. If it’s too heavy, it can be harder to move and more likely to scratch the surface under it. Good handles are also required. While rubber is not mandatory, it does help fight moisture on the hands so it’s better suited for high usage tables. Another thing you should consider is the actual playing style and team configuration. Not everyone likes using the 3-goalie system (technically one goalie as the other two are in defender uniforms), even though it’s very popular these days. If you want a bit of a challenge, go with the classic design. Normally you shouldn’t encounter problems during assembly, but you may find yourself spending anywhere between 10 minutes and 45 minutes to set up one of these tabletop games. Still, much less time than a full size table. As with most home leisure games, generally you will get what you pay for. Most of the time, the price will be reflected in build quality or the number of extra features like replacement balls and a built-in scorekeeping system. 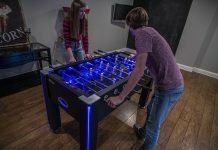 If you’re looking for a way to bring foosball into your home without committing to a full size table, and you want something for the kids too, a tabletop foosball design may be the prefect addition. You now know what to look for in a mini foosball table – a high quality build that is portable, realistic, and kid friendly. Do you own one of these? Let us know what you think. LED Foosball Tables: Light Up Your Game!